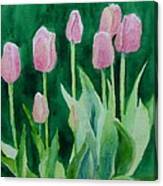 Queen duvet cover (88" x 88") featuring the image "Pink Tulips Colorful Flowers Garden Art Original Watercolor Painting Artist K. Joann Russell" by K Joann Russell. Our soft microfiber duvet covers are hand sewn and include a hidden zipper for easy washing and assembly. Your selected image is printed on the top surface with a soft white surface underneath. All duvet covers are machine washable with cold water and a mild detergent. 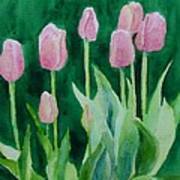 There are no comments for Pink Tulips Colorful Flowers Garden Art Original Watercolor Painting Artist K. Joann Russell. Click here to post the first comment. A neighbor's delicate pink tulips with touches of peach and pale yellow provided the subject for this small watercolor. 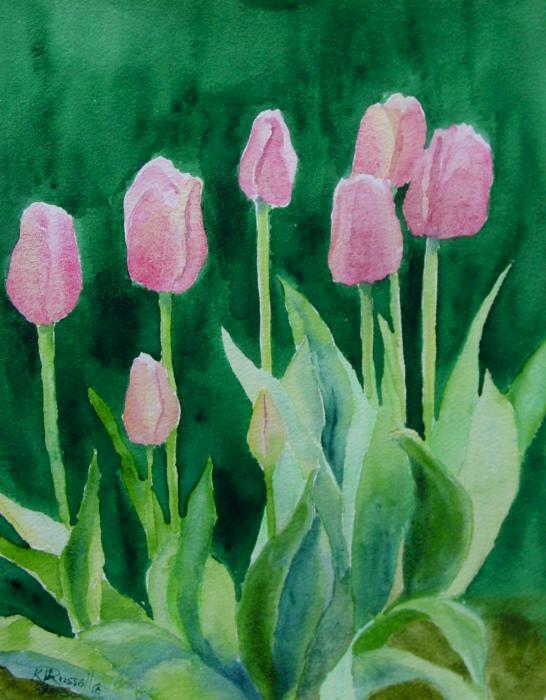 The dark green background contrasts with the light pinks. If you use a white mat when you frame this piece of fine art, the colors will really stand out.